Connemara Sea Week which runs from October 22 to 30, is a multi-disciplinary festival, celebrating the wonderful marine heritage of Connemara. The festival will celebrate its 33rd birthday later this month, and has grown to be a wonderful and unique event with something to interest all age groups. Highlights include art exhibitions, concerts, talks, walks, children’s activities, and sports events, combined with lots of great music and buckets of fun for all the family. A special highlight for the last few years has been the wonderful ‘After the Light’ parade, a spectacular night full of myth, magic, madness and mayhem. Other highlights this year include a one day exploration of the future of planet earth in the company of experts from Ireland and abroad. Eminent speakers at the Notre Dame Centre in Kylemore Abbey will include Bafta winner Doug Allan, Dorothy Cross and Bríona Nic Dhiarmada when topics from the global to local will be under the microscope. Multiple EMMY and BAFTA award-winning, Scottish cameraman, photographer and ecologist, Doug Allan, has spent the last 25 years bringing the most remarkable sights in the natural world into our homes. 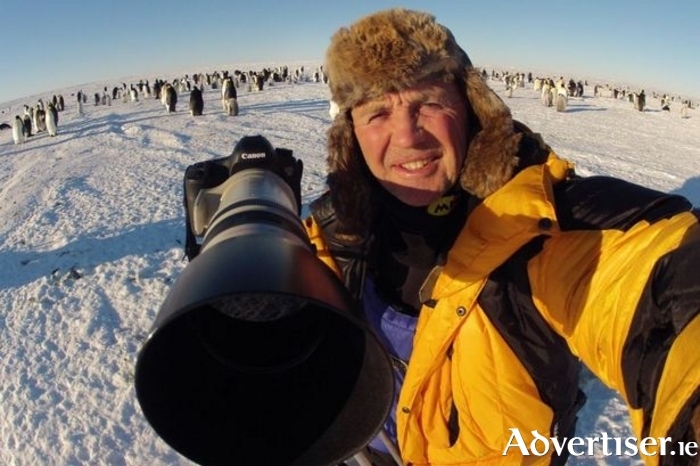 His camera work features in the hugely successful BBC documentaries, Life, Human Planet, Blue Planet, Planet Earth and Frozen Planet. Scotsman Doug has been involved with over 60 films and series, and has worked for BBC, Discovery, National Geographic, and many others. Dorothy Cross is considered to be one of Ireland’s leading international artists. Dorothy resides in Connemara and has a passion for the sea. Working in sculpture, film and photography, Cross examines the relationship between living beings and the natural world. Living in Connemara, a rural area on Ireland’s west coast, the artist sees the body and nature as sites of constant change, creation and destruction, new and old. This flux emerges as strange and unexpected encounters. Many of Cross’ works incorporate items found on the shore, including boats and animal skins, while others reflect on the environment. Briona Nic Diarmada is a professor of Irish studies and concurrent professor of film, television and theatre at Notre Dame University. The author of over 35 screen plays and 10 documentaries, the Irish historian and film maker went on to win the 2007 Television Programme of the Year at the Oireachtas na Gaeilge for ‘Ar Lorg Shorcha’. Narrated by Liam Neeson, Bríona Nic Diarmada’s three part documentary ‘1916 The Irish Rebellion’ sets the Easter Rising in the context of wider world events and was received with great acclaim. Other superb speakers will include farmer Brendan Joyce, American Poet Laureate Mary Swander ,academic Tom Collins, businessman Graham Roberts, Entrepreneur Evelyn O’ Toole, Anthony Previte , community activist, marine scientist Paul Connolly and Mary O’ Malley. As well as inspiring poetry and insightful talks, Sea Week will also be peppered by su- perb music from sublime box player Conor Keane, Dave Harper on guitar and banjo and Katie Theasby on flute. Joining them are two young award winning Connemara musicians flute player Plunkett O’Toole and sean nós singer and dancer Seamus O Flatharta on whistle and harp. The festival will also include trad sessions with the ‘Mighty Hernons’, beautiful music from some of Ireland’s finest musicians and singers in the Gothic Kylemore Abbey, the ‘Screaming Bluecats’ will deliver a mix of Jazz and Blues. The Good Hustle, The Barn- yard Quartet and the Koko Jazz Ensemble will keep the action going. The annual, vibrant Schools Programme will take place from Monday to Friday October 23-27. In conjunction with the Heritage in the Schools Project, ecologist and artist Gordon Darcy; marine biologist Dave McGrath; storyteller and musician Tom McHugh; local ecologists Mags Flaherty and Marie Louise Heffernan will all visit primary schools in the local area. Five enthusiastic teachers with an in-depth knowledge of Connemara will also conduct exciting field trips which are an integral part of the schools programme as they give children a real hands-on experience of their own place. On Wednesday October 25 the Letterfrack Village comes alive with the ‘After the Light’ Parade. A magical night ensues with over 1,000 people participating.